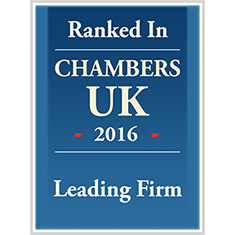 (LONDON) Katten Muchin Rosenman UK LLP announced today the firm's Real Estate practice and two attorneys, Peter Sugden and Joe Payne, were recognised as industry leaders in the 2016 edition of Chambers UK. "Katten's Real Estate practice is one of the cornerstones of our London office, and we continue to make significant strides in both the experience and talent we bring to our clients in this area," said Katten Chairman Vincent A.F. Sergi. "Under Peter's leadership, the office continues to grow with the addition of several top attorneys this year in both real estate and new practice areas like employment law." Recognised in the "Real Estate: Lower Mid-Market" category, the firm's Real Estate practice was lauded for being a "compact team which fields a number of senior real estate experts, particularly in the investment arena." The team also was recognised for advising its "significant retail and hospitality clients" on lease and development issues. Mr. Sugden has served as managing partner of Katten Muchin Rosenman UK since 2012. He is listed among top attorneys in the "Real Estate: London" category and was commended for advising an "array of investor clients" on transactions across "the full gamut of asset classes." He was also lauded for his "in-depth experiences" in development and finance deals. Mr. Payne is ranked among top attorneys in the "Real Estate Litigation: London" category. As a commercial litigator, he primarily represents commercial clients across a range of sectors, including real estate and financial services, particularly focusing upon disputes concerning property, insolvency and professional negligence matters.